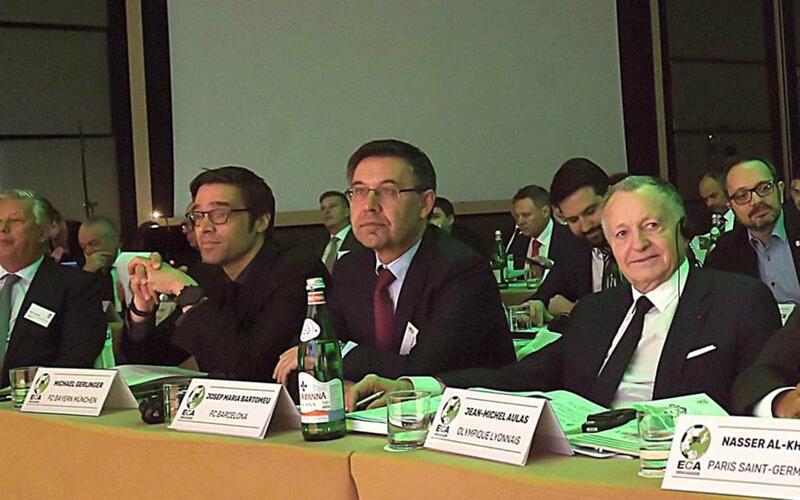 Josep Maria Bartomeu was in Rome this Tuesday for the General Assembly of ECA (European Clubs Association). One of the main items on the agenda was a report to the 163 participant members of the most important changes to the UEFA Champions League and UEFA Europa League for the period from 2018 to 2021. The clubs have approved the changes, including the possibility for players signed in the winter transfer window being able to play Champions League games for their new club even if they have played group matches for their previous team. The clubs also expressed their support for the implementation and improvement of Financial Fair Play regulations for this new period, once they have been passed by the UEFA Executive Committee. Relations with FIFA, included the changes to the FIFA World Cup and negotiations with that body regarding the transfer system were among the others matters discussed by the clubs today. They also agreed on certain criteria for player transfers and status in the presence of FIFA president Gianni Infantino. This is the tenth anniversary of the ECA, and the event was chaired by Andrea Agnelli (Juventus FC), who was appointed president of the organisation last September, when the Executive Committee was restructured, and which has included President Bartomeu since his appointment in May 2014. He is one of four representatives of the Association on the UEFA Professional Football Strategy Council along with Nasser Al-Khelaifi (PSG), Ed Woodward (Manchester United) and Peter Lawell (Celtic FC). This position includes forming part of the leading executive body of European clubs.